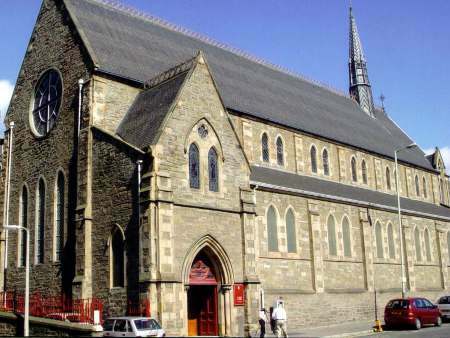 The Church we now know as St Mary Magdalene's was built during 1866–67, and was consecrated on 30th November 1867. It was designed by the Dundee architects Edward & Robertson, and the style is Early English Gothic. The building is 145 feet long, 60 feet wide and 65 feet high, and the main body of the Church is seated for 550 people. The Catholic Apostolic Church, who worshipped here from 1867 until 1944, paid £2,000 for the site and £7,000 for the actual building. When they ceased to worship as a congregation, the building remained empty for seven years. It was then sold to the Vestry of St Mary Magdalene's for £5,000 — a most generous gift. We took possession of the building on Tuesday 12th February 1952. As you select the items in turn on the menu bar above, we take you on a tour round the Church, starting with the Baptistry in the North West corner, then going down the North Aisle to the East End of the Church, continuing round back down the South Aisle, and concluding at the West End and Porch. Many of the photographs reproduced here are the work of Roger Ellis, a member of St Mary Magdalene's congregation.